The results of this study show the one-order of magnitude difference in terahertz radiation power of p-InAs and n-InAs via the ambipolar transport equation in the low-excitation regime. The excess electrons and holes diffuse with a single effective diffusion coefficient equal to the diffusion coefficient of the excess minority carrier. Hence, the higher THz power of the p-InAs can be attributed to its higher effective diffusion coefficient. D. A. Lumantas, A. De Los Reyes, J. Muldera, L. Lopez, A. Somintac, A. Salvador, and E. Estacio. 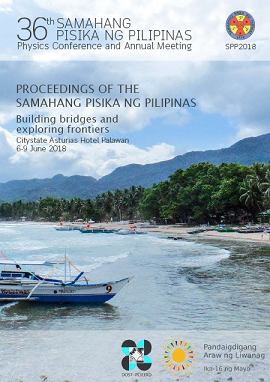 Drift-diffusion in InAs based on ambipolar transport, Proceedings of the Samahang Pisika ng Pilipinas 36, SPP-2018-PA-48 (2018). URL: https://paperview.spp-online.org/proceedings/article/view/SPP-2018-PA-48.